Society rosettes in Ridden Hunter classes. 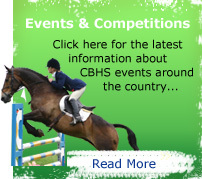 CBHS Rosettes awarded in Sport Horse Classes. The Showground, Borrowash Road, Elvaston, Derby, DE72 3EP. Open to Pure Bred Native Breeds that do not have their own breed classes at the show. Two inhand classes, inhand Championship. The winner of the Inhand Championship is eligible for the Cuddy Supreme Championship. Ridden class, the winner is eligible for the RNAA Ridden Supreme Championship. All horses must be registered with their respective breeds and their registration number must be included on the entry form. The Showground, Leicester Road, Market Harnorough, Leicestershire, LE16 7QX. Westpoint Arena, Clyst St Mary, Exeter, EX5 1DJ.